Established for nearly 35 years, McEvoy Electrical Services Ltd is a leading electrical contracting firm based in Dublin. The family-run business employs a dedicated team of professional electricians in contracting and maintenance service for the commercial, industrial and domestic markets. The RECI approved contractor has covered every aspect of electrical installations in the commercial, industrial and domestic sectors since Brian McEvoy started the business from his home in 1984. From these humble beginnings, McEvoy Electrical has grown to employ 12 staff directly and has been operating from a state-of-the-art premises in Greenogue Industrial Estate, Rathcoole for the past decade. “My father had just two employees and a handful of customers in the beginning. He ran the business from a small unit in Walkinstown for a number of years before moving to our current location in 2008,” director Adam McEvoy explains. 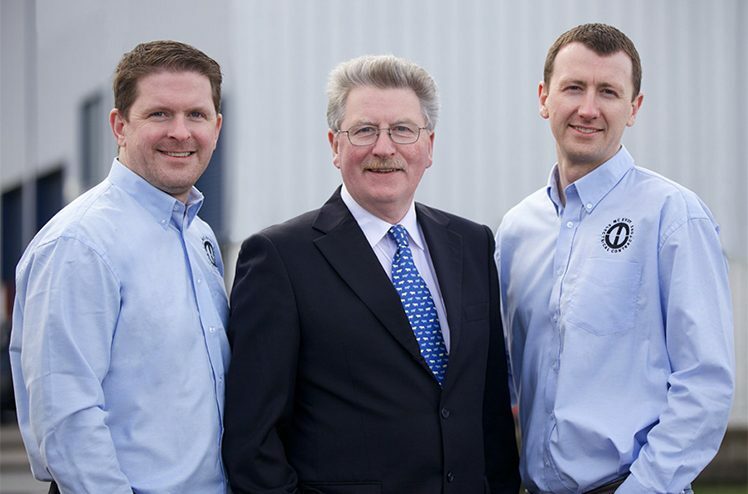 McEvoy Electrical is a real family affair with Brian being joined by his sons Adam and Leigh, and brother-in-law Paul Carr, who looks after the company’s long-standing maintenance contract with BOC Gases. Adam joined the business in 1995 and now runs the day-to-day operations and project management and is also responsible for general installations and maintenance contracts. Leigh came on board in 1999 and is focused on the energy solutions side of the business. He is responsible for new technologies as well as energy-saving and battery and UPS installations. As one of Ireland’s longest trading electrical contractors, McEvoy Electrical has built up a talented and experienced workforce which ensures that all work undertaken is carried out to the highest standards. Having obtained ISO 9001:2015 Quality Management System accreditation, the company takes an independently verified and structured approach to completing projects. Employing a dedicated team of professional and fully-trained electricians using the latest technology in all areas of the industry from design and specification stages, right through to monitoring and control of projects, the highly-regarded contractor has the resources and skillset to deliver unrivalled customer service. “Customers choose us because we cover all aspects of electrical contracting, provide a full design build and maintenance service, are specialists in industrial design and installation, have a wealth of experience in the sector and adhere to the highest industry standards,” Adam continues. McEvoy Electrical’s primary focus is on the industrial and commercial sectors. The company’s range of industrial electrical contracting services include: HV and LV power supplies; temporary and permanent systems; expert design and planning service; comprehensive, quality installations; ongoing and periodic maintenance; hazardous site experience; Health & Safety Risk Assessments and Method Statements; all kinds of light and power systems; bespoke control systems; cable fault location and repair. Commercial installations and maintenance has been a growth area for the contractor in recent years. “We have grown this end of the business with keen pricing and by having a good working relationship with clients, engineers, project managers, architects, interior designers and other contractors,” Adam says. With many new technologies on the market, McEvoy Electrical can offer savings on the latest LED, Induction and T5 fluorescent lamp technology, occupancy detectors as well as control on space and water heating. This is proven technology which can halve energy costs and improve lamp life by up to 100,000 hours and reduce maintenance costs considerably. In addition, McEvoy Electrical specialises in domestic installations, PAT (portable appliance testing), Photovoltaic solar panels, emergency lighting and fire alarms. The contractor has worked on many large-scale projects throughout Ireland down the years and can count the likes of BOC Gases, Irish Rail, ESB, eir, Allianz Worldwide Care, Coillte, NAMA, Energia, Health Express, Hewlett Packard and Europa Batteries among its most valued clients. “We have been working for BOC Gases, which is part of the Linde Group, since 1984,” the affable company director reveals. “We look after the full-time maintenance of their plant in Bluebell and also have crews who are dedicated to installing CO2 detectors on the drink dispensers BOC Sureserve supply to pubs, restaurants and hotels across the country. McEvoy Electrical would like to take this opportunity to thank its staff for their dedication and loyalty, and its clients for their continued support.